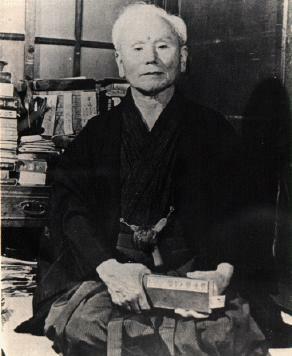 Gichin Funakoshi is widely considered the primary “father” of modern karate due to his efforts to introduce the Okinawan art to mainland Japan, from where it spread to the rest of the world. Born in 1868, he began to study karate at the age of 11, and was a student of the two greatest masters of the time, Azato and Itosu. He grew so proficient that he was initiated into all the major styles of karate in Okinawa at the time. For Master Funakoshi, the word karate eventually took on a deeper and broader meaning through the synthesis of these many methods, becoming karate-do, literally the “way of karate,” or of the empty hand. Training in karate-do became an education for life itself. Master Funakoshi taught only one method, a total discipline, which represented a synthesis of Okinawan karate styles. This method became known as Shotokan, literally the clan or the house of Shoto, which was the Master’s pen name for his poetry, denoting the sound of the wind blowing through pines. Gichin Funakoshi passed away in 1957 at the age of 88. Aside from creating Shotokan karate and introducing it to Japan and the world, he also wrote the very book on the subject of karate, “Ryukyu Kempo: Karate-do”. He also wrote “Karate-Do Kyohan” – The Master Text, the “handbook” of Shotokan and he wrote his autobiography, “Karate-Do: My Way of Life”. These books and his art are a fitting legacy for this unassuming and gentle man.